Creativity is born in uncertainty. 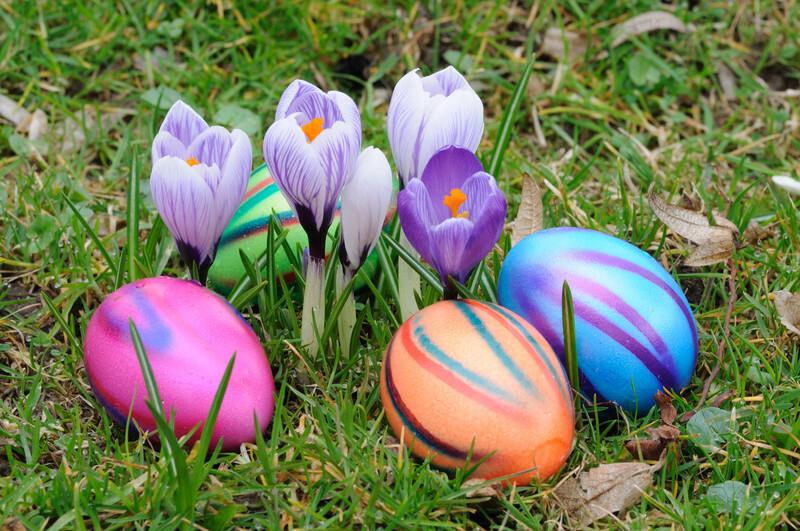 It’s a grand Easter egg hunt – the more you search, the more possibilities you explore, the better your chances of finding the best solution. Your challenge is that even if you may be consciously willing to keep looking, your brain isn’t. Because the human brain, which makes up only 3% of the body’s mass, uses 20 to 30% of the body’s oxygen and glucose, it’s evolved to be as energy-efficient as possible. Uncertainty is simply not efficient. Why question what you already know? Why keep looking for more solutions when the one you have is good enough? The first solution you find may not be the best, but once you make a decision, your brain sticks with it. Second-guessing takes energy and time away from other vital brain functions. The brain also tends to interpret new information to fit the decision you already made. It’s more efficient than identifying and comparing a multiple of new decision possibilities. Sway: The Irresistible Pull of Irrational Behavior highlights the dangers of “diagnosis bias,” the tendency to ignore information that doesn’t fit your initial categorization or to manipulate that information until it does fit. To illustrate diagnosis bias, imagine two urbanites on a day trip to the country, looking over a green hill dotted with white shapes. 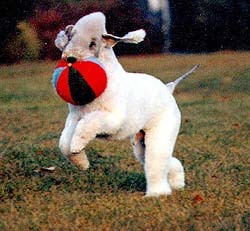 Note: The Bedlington Terrier was bred to look like the sheep it guards from predators. 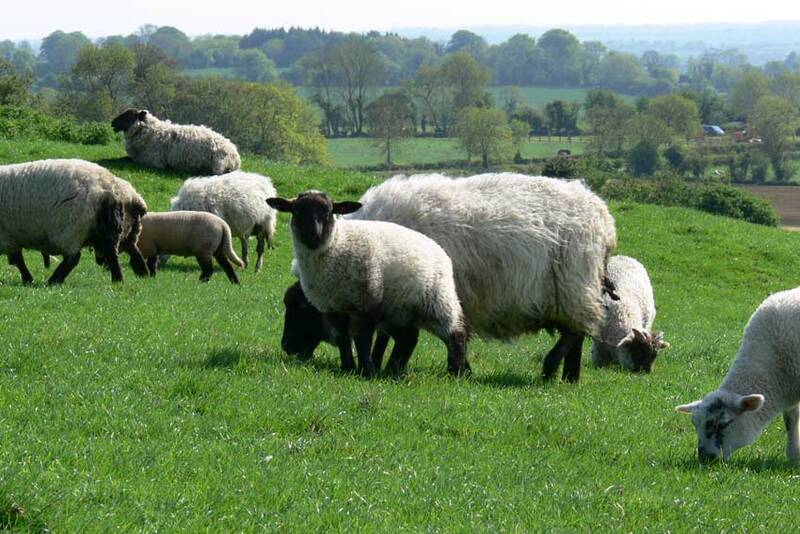 The fact that it gives shepherds so many opportunities to laugh at city slickers is just a bonus. Fortunately, the brain has also evolved to be curious. When we learn or experience something new, the brain gives itself a squirt of dopamine, the feel-good neurotransmitter. We are wired for creativity as well as efficiency, but for most of us, efficiency-seeking is the default. That’s why we need to remind ourselves to question our own certainty, to throw ourselves off-balance and to expose ourselves to foreign ideas from time to time. As writers, as creative people, we need to push ourselves, or put ourselves in places to be pushed by others, beyond certainty. 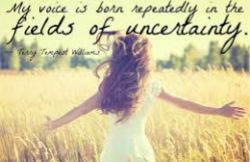 Embrace uncertainty! 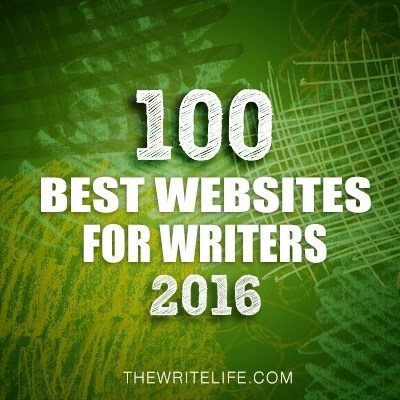 Who or what challenges your worldview, your beliefs about writing, your writing skills? Awesome post! Letting go of certainty is so hard but so necessary. Thanks Claire. I find it’s a bit easier (but not easy) to let go when I recognize it as part of the creative process. My friend Caitlyn James constantly questions my default settings. I wish we lived closer so we could have lunch regularly; Vancouver BC is just such a drive from Wisconsin. She’s my solid gold beta reader, too. Potent feedback on my WIP. My middle daughter has always been my musical touchstone. She knows when I’m stretching, and when I’m slacking. I’ve studied the art of decision-making a good bit, and the point made by all the experts is that a choice which has only one option (“whether or not” choices) is your worst type of choice. Any time you can see another option (“this, or that, or neither, or both?”) you exponentially expand your chances for success. Everyone should have a Caitlyn in their lives! About multiple options: I just finished reading Sway, which mentions that too many choices can cause paralysis… So we want more than one option, but less than 24 (or 17 or 6 or?). Have you read Barry Schwartz’s “Paradox of Choice” ? First book I read on how our minds fail to work as expected. So much evidence that too many choices paralyzes. But too few, narrow framing, hurts. Chip and Dan Heath, in “Decisive,” acknowledge the dangers at both ends, and recommend “a small number of options.” leaving it to us to measure. So many books, so little time… But I will put Paradox of Choice on my list. Thanks. I fully expected you to know the book; you already share many of its precepts. But well worth the read.